There's two reasons we want the Integra rear suspension. The first is that we'll be able to replace the crappy civic drum brakes with the newer Integra disk brakes. The second is that we'll be able to use the stiffer/newer Integra spring and damper. I was a little afraid that the '95 Integra parts wouldn't fit. The 90-93 (DA) Integra's rear trailing arms were the ones that were typically swapped into the 88-91 (EF) Civics. The later 94-01 (DC) Integra might be different. We went ahead and pulled the rear passenger side suspension off both the Integra and the Civic. 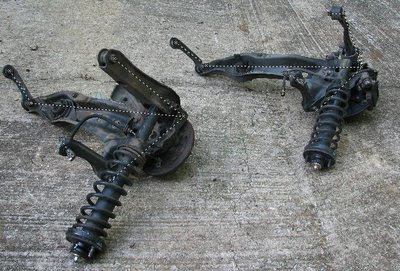 The trailing arm looked very similar, but the compensator arms were dramatically different. I did some measurements using Photomodeler and it confirmed that the arms were very close. Photomodeler lets you take several photographs of an object and can trangulate the XYZ coordinates of selected points. It works great for situations where you can't easily measure between two points because they are on aribtrary planes. The measurements arn't terribly accurate, but they were better than I could do with a tape measure. The upper and lower control arms are close, but the Integra arms seem slightly longer. I kept the Civic upper arm, since it should give us slightly more camber.